Don’t Get Caught in the College Debt Crisis! InnerSight brings focus to your college Journey saving you both time and money. Selecting a major that people like you prefer can take years off of your college experience, help you answer that “What Do you Want to Major in” question when you really do not have a clue. 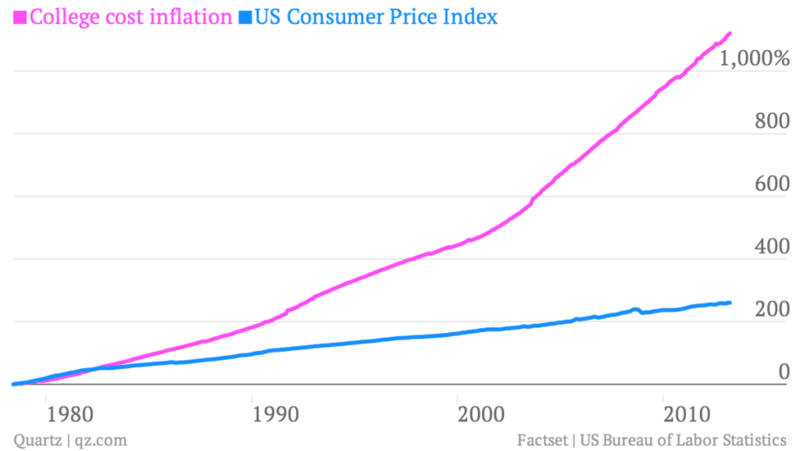 The College tour will not tell you much about the growing student borrowing bubble. 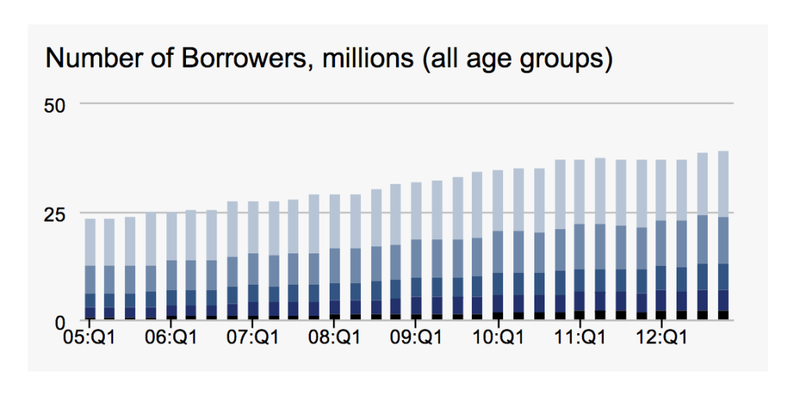 Mathew Phillips in a May 2013 article Everything you need to know about the student borrowing bubble in 17 charts, shares the shocking facts about this growing challenge. Here are a few of his powerful charts and observations! Americans have tempered their appetite for debt in the aftermath of the financial crisis, except when it comes to student debt. 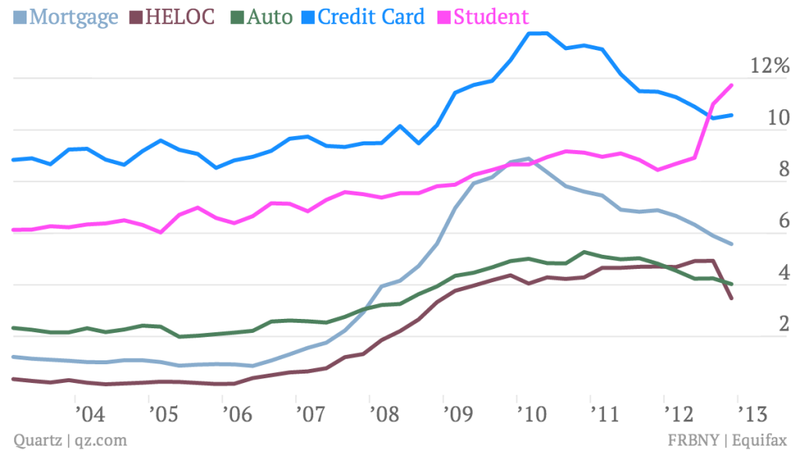 Over the last few years the outstanding amount of US student debt has surpassed the stock of automotive, home equity lines of credit and credit card debt. 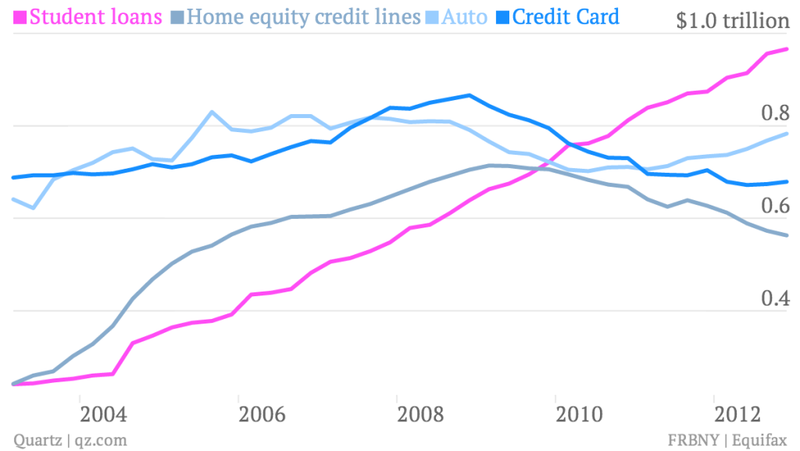 With just shy of $1 trillion in student loans outstanding, mortgages are the only form of debt Americans have more of. 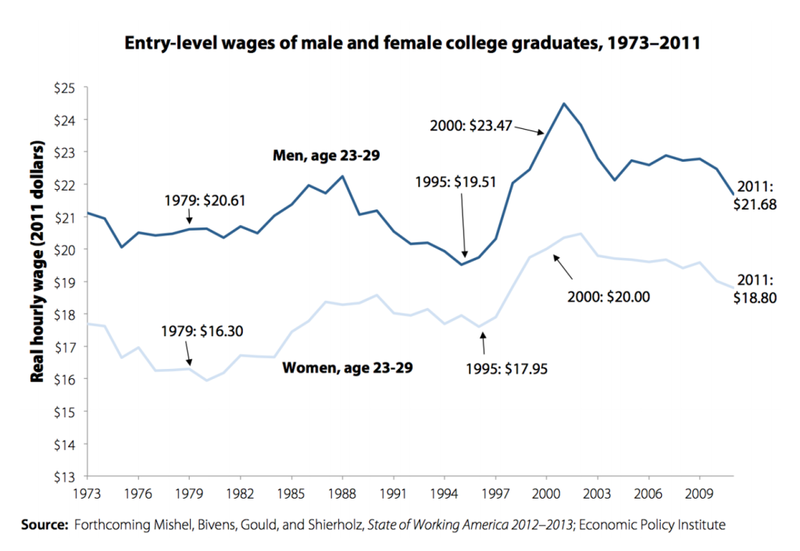 On top of that long-term trend, when the great recession hit, many had difficultly finding work and instead returned to school to burnish their skills and wait out the worst of the downturn. And plenty took on debt to do it. As a result, the number of people carrying student debt has been moving steadily higher, the New York Fed reports. 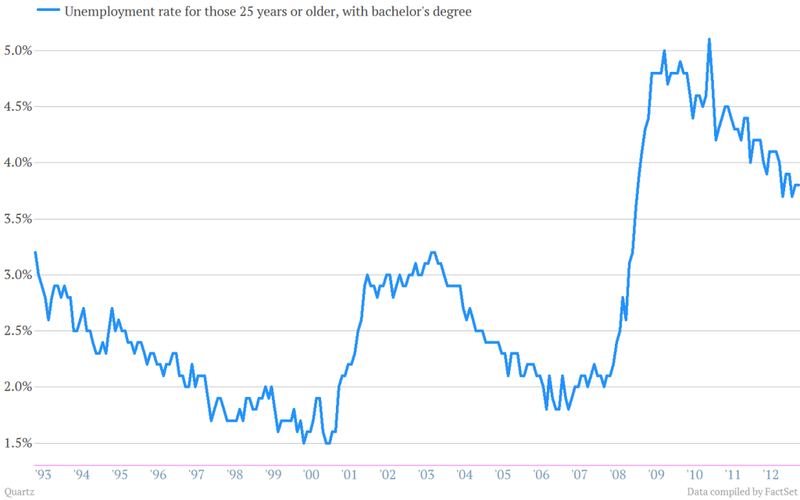 But it’s not just numbers of people that’s pushing student debt higher. The average amount of student debt these people are taking on is growing too. 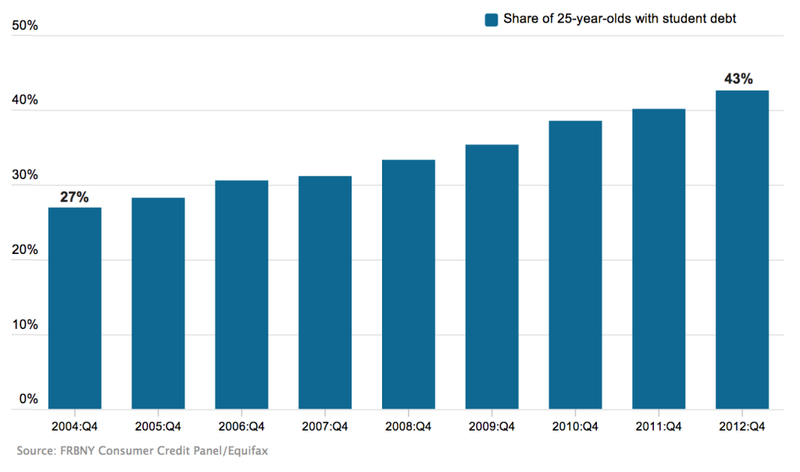 So, student debt is becoming a much more common fact of life for young Americans, with some 43% of all 25-year-olds carrying student debt at the end of 2012. Just eight years ago it was 27%. That figure includes everybody over the age of 25. A February report on the job prospects of recent graduates showed higher rates of unemployment for those between ages 20 and 29. Researchers found that the cohort of people who graduated in 2011—either from graduate and undergraduate programs—had an unemployment rate of 12.6%. 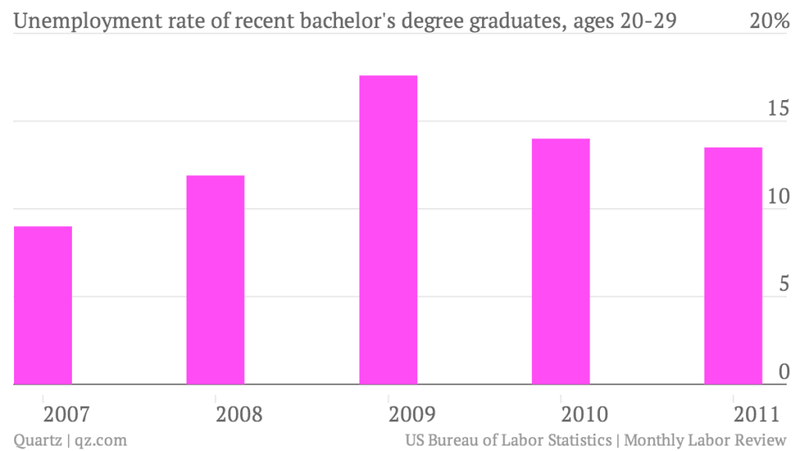 If you just look at those with bachelor’s degrees, it’s 13.5%. Here’s a look at the percentage of the outstanding balance of different types of consumer debt that are 90 days delinquent. 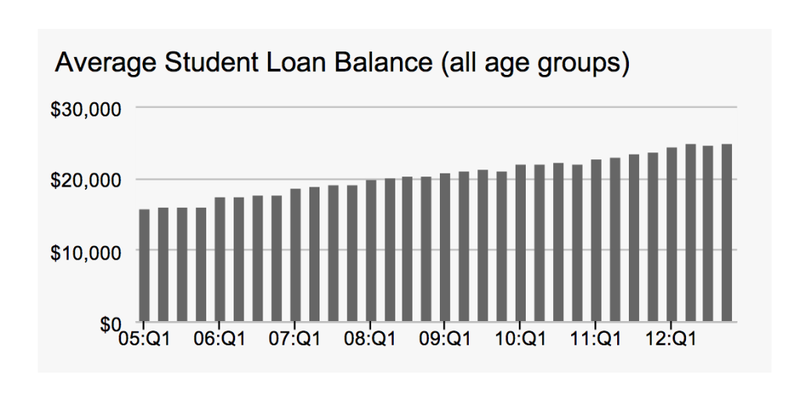 You can see that student debt has ticked higher in recent months. And by the way, these numbers likely understate the extent of the problem since more than 40% of borrowers are estimated to be currently in a forbearance, grace or deferment period when payments don’t have to be made. In fact,researchers at the New York Fed say that the true rate of borrowers at least 90 days behind on their student loan payments is over 30%.